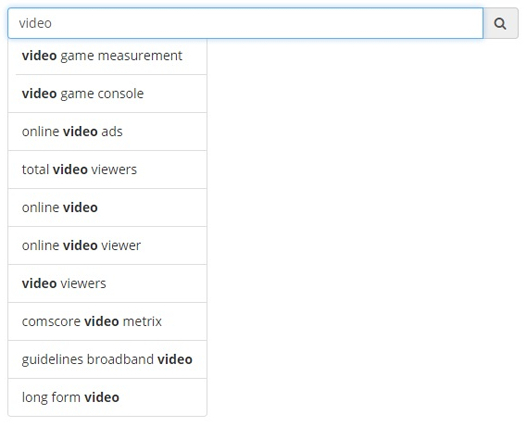 Does your search need meaningful auto-suggest (or auto-complete)? Contegra’s auto-suggest is a semantic search module compatible with Solr, dtSearch and other search engines. As users begin typing search terms, auto-suggest displays a list of key phrases matching the letters entered in the search box. While auto-suggest for searching is quite standard on e-commerce and public search sites (Amazon, Google and Bing), there is often insufficient search history data on enterprise sites, subscription sites and sites with smaller audiences to produce meaningful suggestions. Contegra’s innovative approach creates the list of suggested key terms and phrases by leveraging keyword extraction algorithms. The result is highly relevant query suggestions. The list is derived from harvesting 10-15 of the most important keywords and phrases from each document in the collection. Key phrases are selected using statistical algorithms and natural language processing technology that analyzes the content and identifies the most significant terms in each document. Additional coding further improves our auto-suggest's data quality by employing stemming algorithms and data normalization for capitalization and punctuation. Contegra’s auto-suggest helps users better articulate their search queries by proposing terms and phrases that are present in the corpus. Viewing the important phrases in real-time guides the user through the search process, helping them construct search queries. It increases the quality of the user’s query and in turn, returns more relevant results. Auto-suggest is compatible with several search engines including Solr, dtSearch, Rocket NXT and Contegra’s KaleidoSearch faceted search product.